During a recent seminar in California, I was approached by a man named Ross who told me he is “successfully failing” in his business. Ross employs over a hundred people. His company is thriving, which enables him to provide his employees with excellent wages, benefits and opportunities for career advancement. Even so, Ross feels that he’s failing the people who work for him. Worse yet, he feels like he’s failing the Lord. Why? Because he knows that many of his employees do not yet know Jesus as their Savior, and he’s not found an appropriate way to introduce them to the gospel. Ross is not alone. Dozens of business owners and managers have shared with me the same dilemma. They sincerely care about the people they employ and pay them well, and yet they know they are failing to give them what they need most, an introduction to Jesus. Multiply these few conversations across the 28 million small businesses in this country, and you have thousands upon thousands of owners and managers who are looking for a way to share the love of Christ with the people they work with every day. Every morning, 126 million Americans go to work in full-time jobs. Recent studies indicate that at least a third of these people—40 million souls—do not trust in Christ (click here for data sources). And yet they work side-by-side with over 80 million people who identify as Christians. Many of these believers have approached me during seminars and said the same thing Ross did. They want to share the message of eternal life with their coworkers, many of whom are good friends. But they don’t know how to start that conversation in a way that is suitable for the workplace. We have adapted the original relational wisdom paradigm so that it can be taught in secular settings and used to open the door for the gospel. Instead of referring to “God-aware” and “God-engaging,” we use the terms “values-aware” and “values-engaging” (see summary of key principles here). We also paraphrase key wisdom principles (“treat others the same way you’d like them to treat you”) and modify the key acrostics to create a “common grace” form of relational wisdom. 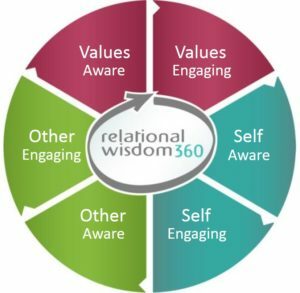 Our staff and Certified RW Instructors have already taught this version of relational wisdom in a wide variety of secular settings, including schools, businesses, military bases, sports camps, surgical centers, as well as police and fire departments. When we then ask people to describe how their value systems are shaping and benefiting their lives, Christians have a perfect opportunity to share how faith in God and obedience to the Bible has changed their lives—and in some cases, saved their marriages or another important relationship. This positive witness can carry over to more meaningful conversations between coworkers long after a seminar is over. At the end of every live seminar, we also mention that we have free faith-based materials available for those who want them, all of which are taken before we walk out the door. In many cases, our instructors are asked where they go to church … and then they see those people walk through the door the following Sunday. As thrilled as we are by the response to our live values-based seminars, we know we are reaching only a small fraction of the 40 million workers who do not yet know Christ. 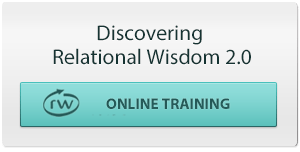 The best way for us to reach these workers with the gospel is to produce an online values-based version of our existing web-based course, Discovering Relational Wisdom 2.0. Once we can offer a values-based version of this online training along with our existing faith-based version, Christian business owners will have an easy way to introduce their employees to Jesus. For example, Ross will be able to purchase 100 access codes to our online training (at a discounted bulk rate) and offer them to his entire team as an employee benefit, giving workers the option of choosing whichever version of the training they prefer. Workers who choose either version will receive valuable training in relational and peacemaking principles that can improve their work performance as well as their family lives (as these compelling studies show). That’s great, but we want to achieve something that provides eternal benefits. Every person who takes either version of our online training will be offered a free RW360 Smartphone App. This app has two tabs at the top of the home screen. You guessed it: “Faith-Based” and “Values-Based.” Every time a non-Christian opens the app to access values-based content, he or she will see that Faith-Based tab at the top of the screen. Our constant prayer will be that Holy-Spirit-enhanced-curiosity will move many people to touch that Faith-Based tab, in which case they will quickly encounter the gospel itself. But that’s just one path to the gospel. We plan to build many more into the new online course. 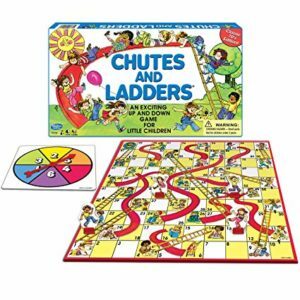 Perhaps you remember the classic children’s game, “Chutes and Ladders.” Each player advances on the playing board according to die rolls, moving ahead more quickly when landing on a “ladder” square or sliding backwards when landing on a “chute” square. We intend to build a series of discreet “chutes” and “ladders” into our online values-based course, each of which will give students the opportunity to click on a link that enables them to learn about the differences between the values-based and faith-based versions of RW … and especially about the life-changing power of the gospel. We would like to begin filming the videos for this new course early in 2019. We will also need to rewrite hundreds of pages of online materials and develop a new values-based section of our website. Once these resources are completed, we’ll need to develop and launch a marketing program to let as many Christian employers and workers as possible know about this new way to begin a gospel conversation at work. We estimate that this project will cost between $60,000 and $75,000, in addition to our normal operating costs of $25,000 per month. Your generous gift this month or pledge of ongoing support in the coming year will enable us to move ahead with this unique program to bring the gospel into thousands of businesses, schools and other secular settings in the coming year. You can be a vital part of this effort. Your gift could make such a difference. Our team will be thankful for whatever you are able to give. PS: My first seminar in 2019 is to teach values-based RW to our State Legislators and their staffs. This morning I received an inquiry about providing similar training for members of the U.S. House of Representatives. Was there ever a time when biblically derived relational skills would be more useful for those who govern our cities, states and country? PPS: To learn how God used the prayers, encouragement and financial support of friends like to to enable us to bring RW and peacemaking training to over 34,000 people in 55 countries this year, please see this Harvest Report.